Band Camp dates were announced at the Band Banquet. Below are the dates / costs associated with each camp. Also, attached are the forms needed for band camp. Any payments sent in for camp will not be processed until after July 1st. As of July 1st the budget for the 2018-2019 year goes into affect. Please keep scrolling all the way to the bottom of this page. It is full of useful information for band camp. 2018/2019 Band Camp Forms now available. Please fill out and return with first payment or first day of camp. WATER, WATER, WATER, & MORE WATER!!! SUNSCREEN, SUNSCREEN, SUNSCREEN, & OH YEAH, MORE SUNSCREEN!!! Bring it full of Gatorade or water each morning. We will have more to refill it throughout the day. You MUST wear tennis shoes while on the field. 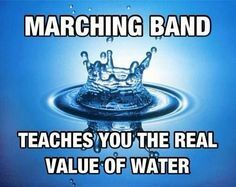 You cannot march in sandals or flip flops. You may want to have 2 pairs of tennis shoes (one in case it rains and the field is muddy). All students MUST wear socks. Once you come into the church, your shoes must be left in the foyer. You are NOT allowed to go around in your bare feet in the church. You may want to bring sun screen and bug spray. you WILL be outside most of the day. It has been extremely hot and there are always ants and bees in the field (remember you're invading their territory!). If you have asthma or allergies PLEASE have your inhaler and/or EPI pen on you at all times!!! If you take any other medications, please bring them with you if you will need them during your stay at camp. Start digging out those bibs, shoes and gloves – check to make sure everything fits. Make sure that you have 2 shoes…stop laughing….several only had one shoe last year! If you need new bibs, shoes or gloves – you can order them at camp. Please feel free to drop by camp any time to see what the kids are learning! Please feel free to drop by camp any time just to say hi! we can't wait to meet you! You can drop off any drinks or snacks any day at camp this week.